Two beautiful cards came unexpectedly from Algeria this week. The first shows dancers in traditional costume. Women often wear this traditional dress, the karakou, at weddings. The second shows El Kantara, a strategic point for the Romans at the entrance to the Sahara. There is an old Roman bridge over the river. It is one of the best known sites in Algeria. That's funny, I also had a card from Algeria a couple of weeks ago! What a lovely surprise to see you again in Beth's meme, I don't know for you but I remember your blog and name from years ago, when I first attempt this hop. So you are also a posscrosser ? I join the posscrossing just two months ago. Those two cards are great, a peace of culture and history. 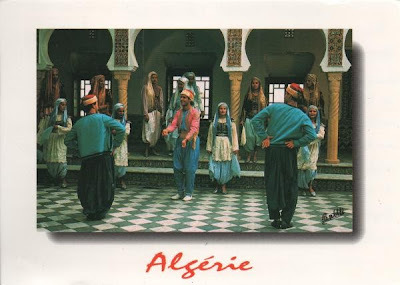 I don't have any from algeria, from morocco yes, I hope I'll have one from tunisia one of this days. 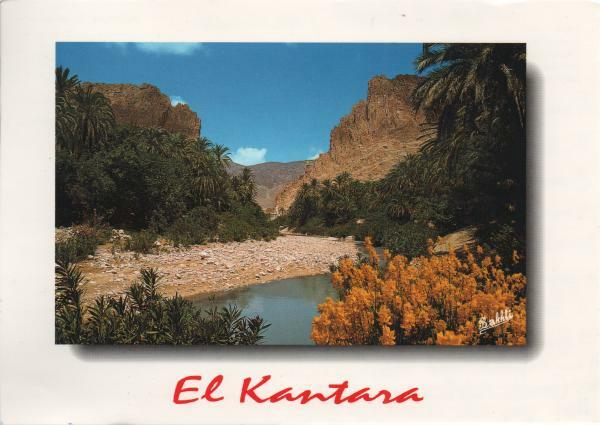 I never heard about El Kantara, it's a nice share. Algeria is a country about which I know almost nothing. I guess I should look it up on the computer so I will be able to feel a bit more intelligent!! !